What is the Sierra Cup? California and Nevada has been the home of a number of notable river festivals, rodeos and races throughout the years. The Sierra Cup links these great paddling events into a “for fun” slalom series, which spans the boating season. Points are awarded for entering slalom races at any of the seven series events and for placing in an event (more on that later). All ages, gender, abilities, and types of boats participate in the races. At the end of the season, the points are tallied and winners announced. Awards are presented to the top ten finishers overall. The first place boater’s name is inscribed on the Sierra Cup (currently on display at Sierra South River Store, Kernville, California). Since all ability levels have an equal opportunity to accumulate points, everyone has a chance to place in the top ten -- novices, intermediates and experts alike! 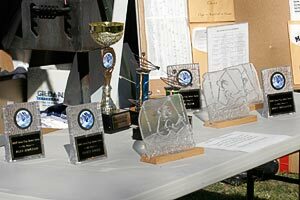 Awards are given at the following year’s Kern River Festival. Several of the 2004 season Sierra Cup awards were original glass designs by Dana Heins-Gelder. Dana graciously agreed to create the awards for the 2005 season and these will be presented at the 2006 Kern Festival party. Thanks Dana!! The Sierra Cup Slalom series is open to any paddler who participates in two or more slalom races in the series. A paddlers race results (place) is used to compute total points. Points are accumulated by class (K1, K1W, C1, C2, OC1, etc) for each competitor. A paddler may earn points in more than one class; however, points are accumulated by class only. In the final tally, a boater may only place in one of the ten top places. Cup races generally follow ICF slalom rules for penalties. Each local organization hosting an event can determine the manner in which their race is run and scored; i.e. best of two runs or combined total. In the event of a tie, the paddler who attended the most races is placed higher. If there is still a tie, the paddler competing in the larger class is placed higher. Even though paddlers who place first in their class generally move up to the next class, there is no “official” rule regarding this. However, for Sierra Cup results, if a boater places first in any class and does not move up to the next class in subsequent races, their points will still be tallied with the higher level class that they should have moved into. The maximum number of races to be used for final calculations will be six races, i.e. the lowest score of one race will be dropped if attending seven races. The Sierra Cup organizers have final say in all aspects of the Series regarding tabulation of points and the rankings of the participants. Their decisions are final. Everyone who enters receives a minimum of 1 point. Percentage points are added to each score based on size of class. For classes less than 3 in size and for the last person in each class a percentage calculation adjustment will be used, their time vs. the best time in their gender (less than 3) or of their own class (last person to next to last). There is no charge for entering the Sierra Cup Series. Who is hosting the races included in the Sierra Cup? The Sierra Cup is a collaboration of the following paddling clubs and organizations: Kern Valley River Council, Kern River Alliance, Loma Prieta Paddlers, South Fork of the American Paddlers, Sierra Nevada Whitewater Club, and Sierra Club RTS, San Francisco Bay Chapter. See the Sierra Cup Series Schedule for event information. Who can enter the slalom races? How do I sign up for the Sierra Cup? The best reason for participating in the Sierra Cup is that it’s fun, but it also gives you a chance to meet other paddlers and the rivers they haunt, to paddle places other than your home rivers. Some of the race organizers also host great festivals, parties, and auctions where you can check out the latest and greatest equipment. The local organization hosting each race determines all entry fees and requirements, operating procedures and rules for the race. The host organization of each race is responsible for verifying the completion of the appropriate registration forms and waivers and maintaining those records. The Sierra Cup Series is an end-of-season point tabulation based on the results of independently organized slalom events.